Designed for use with all 9" (228mm) industrial thermometers to create a "sealed system". 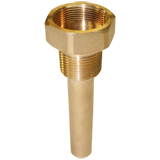 Thermowells provide insertion of various temperature instruments while protecting them from damage due to process media pressure, abrasion, velocity, or corrosion. In addition, thermowells allow for removal of temperature instruments for repair, replacement, or calibration without the need to shut down or drain the process.